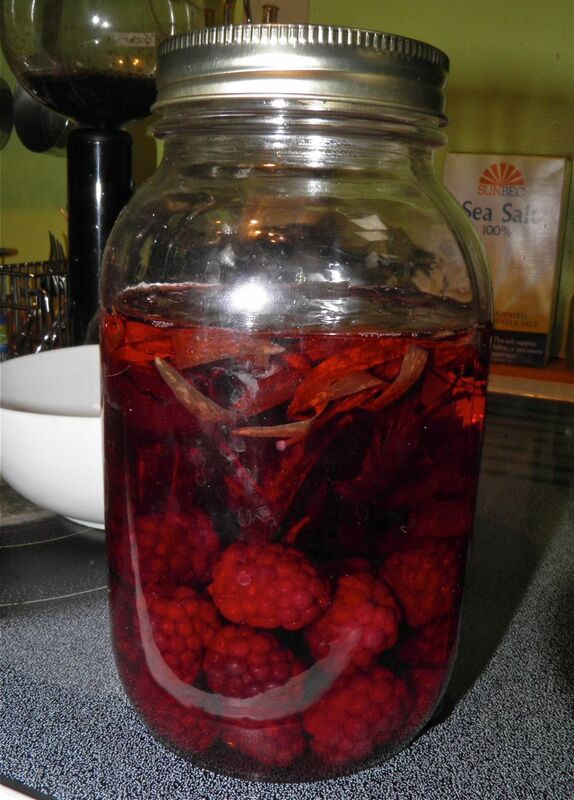 Blackberry tarragon vinegar, all ready for summer salads! Here’s a summer salad vinegar recipe for you all. I suppose you'll either love it or hate it. It combines that taste of fresh blackberries with tarragon. Flavoured vinegars can add a dramatic twist to summer patio gatherings, either as a dressing or just the way it is. You can use any soft fruit to flavour vinegar. Other possibilities are blueberries, strawberries, raspberries, cherries, kiwis, currants… I think you get the picture. I have made blueberry and raspberry in the past with great results. The trick, if there is one, is to pair whatever fruit you use with a complimentary herb to round out the taste. I have used tarragon with my blueberry and basil with strawberry in the past. Just don’t use too much or it will overpower the delicate berry taste. But feel free to use your imagination for interesting combinations. At least one study from Memorial University in Newfoundland shows that the disease-fighting phyto-chemicals may become even more potent in the fermenting process of making vinegar from fruit. Now this vinegar isn’t fermented from the fruit but that isn’t to say that some of the properties in the fruit are not transferred as it infuses. It pretty much has to since the flavour is transferred. Blackberry vinegar – as all fruit infused vinegars – has many uses. Try it in a vinaigrette or salad dressing for fruit or greens. It can also be used as a marinade for meats or can even be tossed with cooked vegetables for a tangy zest. It can also be used in a glaze for over fresh fruit and ice cream, or even to deglaze a pan when preparing sauces. 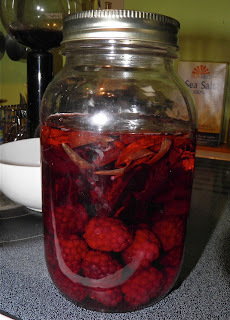 Wash the berries and place in a 1 L Mason jar with the vinegar and tarragon. Shake well and let sit for 2 weeks. Shake every so often. At the end of the 2 weeks, strain the mixture through a sieve. 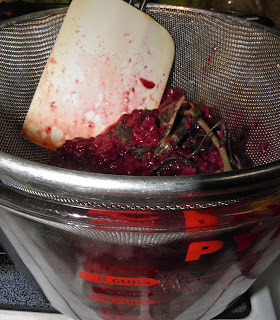 Press as much liquid out of the berries as you can without forcing any pulp through to the vinegar. If you do get some pulp, restrain through fine cotton cloth so the vinegar is a clear as possible. 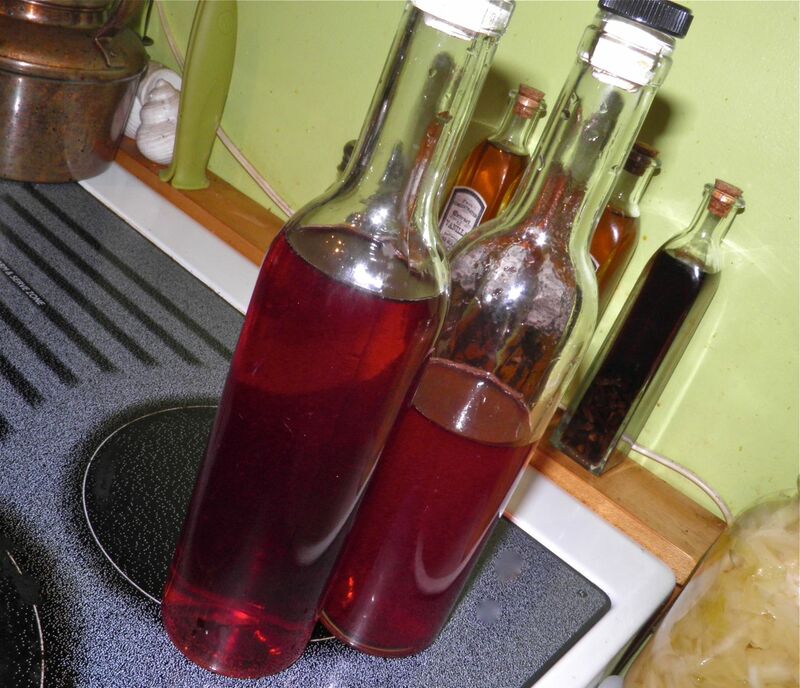 Homemade fruit vinegars will last for several months if kept out of direct sunlight and longer if refrigerated.